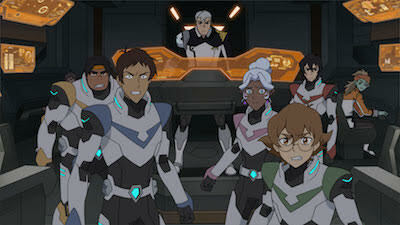 "We are incredibly proud to bring the story of Voltron Legendary defender to a close with the 8th and final season. It has been an absolute honor to work alongside such a talented and dedicated crew these past 4 years over 78 episodes. Witnessing the fandom grow and evolve alongside the show has been nothing short of amazing and saying goodbye to these characters, the amazing worlds they inhabit and the crazy vehicles they pilot will be truly bittersweet. We can only hope that this series will be looked back on fondly in the years to come and stoke the creative flame inside all of us, the same way the original did when we first watched it." - executive producers Joaquim Dos Santos and Lauren Montgomery. My youngest nephew loves shows like this. I watch with him a lot, so no doubt I'll be seeing this, lol. My nephew loves them too. My son watches them also.